'In The Four Agreements, don Miguel Ruiz reveals the source of self-limiting beliefs that rob us of joy and create needless suffering. So it says on the back of the book, and so it is. 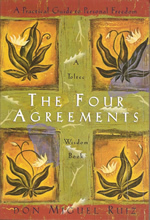 The Four Agreements is a small gem of a book that is simple, clear and radical in its ability to reshape our lives. The Four Agreements ('Be impeccable with your word', 'Don't take anything personally', 'Don't make assumptions' & 'Always do your best') are not easy to maintain at all times; but the more we integrate them into our life, the more we will be transformed.